Fitting Saddles to Horses and Mules — Colin Dangaard, Inc.
Every horse or mule is different, just similar. The same goes for hand-made saddles. No two are the same, just similar. Australian saddles fit an interesting place in saddlery: they are somewhere in between a Western saddle and an English saddle. And for good reason. They were not designed as flashy decorative pieces of trophy equipment, which is the idea behind many Western saddles, growing out of centuries of Spanish tradition where only really wealthy people owned saddles. And Aussie saddles were not designed to fall out of, which is the idea behind English saddles, growing out of the pillar of aristocratic thought that if you didn't ride perfectly, you fell, as punishment. The modern English saddlery was born in the British Cavalry. Australians chasing feral cattle on the roughest country on Earth didn't give a damn about flash, and even less about tradition. They just wanted to stay alive. They are three distinctly different saddles. They are even measured differently. Australian saddle size is measured by using a straight rule, and running it from the stitched seam in the front, to the inside of the back of the cantle. The measurement ends where the cantle starts to rise up over the top. This makes it an actual tree measurement. The capacity of the seat varies from model to model, most commonly struck by the position of the knee pad. Seat measurements can, and do, vary up to l/4", plus or minus. But that is a very small difference as far as a rider is concerned. Western saddles are measured from the rider side of the horn, back to the top of the cantle, and English saddles are measured from the button in the front, diagonally back to the top of the cantle. When selecting an Australian seat, let us guide you, because we are familiar with the variations of ALL Australian models. The breed of the animal matters little. A Quarter horse does not know he is a Quarter horse, and an Appy has no idea he is an Appy. Now mules, they are different. But let's get one fact straight: fitting mules is EASY. I hear about hard to fit mules, but in 30 years of saddling them, I have yet to meet one. From one mule to the next, they are actually less different than horses. I have, however, met my share of hard to fit people! A mule has only one opinion: does this saddle hurt? People have endless opinions, prejudices, money concerns and THEN they carry the opinions of their trainer, best friend, Uncle Buford in the Smokey Mountains, etc., etc. Mules have definite but low withers, and straight backs. By comparison, horses have a vast range of wither definition, and placement on the back, along with virtually endless degrees of sway. Problems occur when fitting mules with solid tree saddles designed for horses. It rarely works well. Mules are booming in popularity. Trail riders who have spent their lives with horses are finally discovering the toughness and dependability that is born to the Long Eared One. Once they understand what makes a mule different, both physically and emotionally, they rarely go back. Traditionally, Australian saddles are built on wood/steel trees. This technology goes back to the Middle Ages. A steel frame is fixed to wood, to bear the screws and tacks that hold together a saddle. 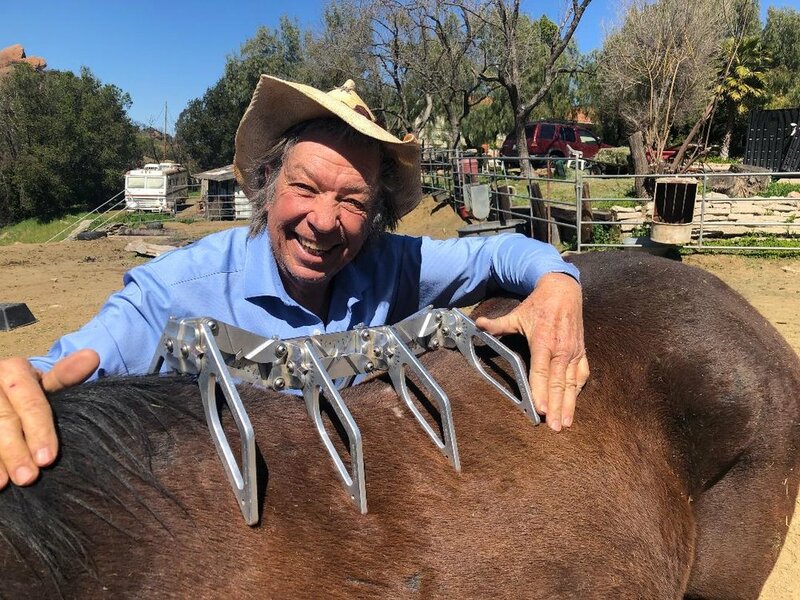 Even after such a saddle has been built for a horse, our experts in Malibu can pull in the gullet and flatten the bars to make it fit a mule. Again, this is nothing new. Three hundred years ago troops in battle pulled leather off the steel arches of trooper saddles, heated them in a fire and, by hand, manipulated the tree to fit a war horse to replace the one shot out from under them just hours before. Today, I have clients who change horse with about the same frequency I change my mind. I've altered the same saddle several times. Australian saddles come in stuffed panels, for high-withered animals, or fleece for low-withered mounts. Obviously fleece is more ideal for mules. Crupper or breeching is always recommended, as mules are slab shouldered. A breastplate is also a good idea. To really appreciate a mule you need steep country. Stuff that might freak out a horse. So it is imperative that the saddle sits close to the back, and is solidly in place. You want to be looking at those lovely long ears, not sitting on them! Getting the right equipment for a mule is half of what is necessary. YOU getting the right attitude is the other half. Unlike horses, mules do not tolerate people who are unreasonable or overly demanding. Get tough with a mule, and hell remember it and one day, hell nail you! Mules are not recommended for people who, to function in society, need anger management therapy! In this regard, mules are much smarter than horses. They accept only the utmost respect and kindness. They love positive reward for good behavior, but mentally cannot handle negative reward for bad behavior. Out on the trail, if you beat a mule to try and get him over a stream, he just might sit down, literally, and nothing will move him until HE feels like moving! You have to be at least smarter than the mule. Its like that old story: Put a horse in a trailer, go down the road and have a wreck, and the horse will never forget the trailer. It will take lots of training to coax him back into one. Put a mule in a trailer, go down the road and have a wreck, and he will never forget that YOU put him in the trailer! BELOW ARE FOUR DIFFERENT SADDLES FITTING PERFECTLY ON THE SAME HORSE. MY POINT IS, THE STYLE OF SADDLE HAS NOTHING TO WITH THE FIT. IF THE UNDERSIDE OF THE SADDLE MIRRORS THE TOP SIDE OF THE HORSE, IT FITS. At left is my personal Australian stock saddle sitting on my very handy mare Breeze. See how it sits with no girth. When it is cinched, it will be level and in the right place. Below is a JS Champion sitting on the same horse. It also fits perfectly. Note how it is level. Above, my personal cross country saddle, on the same horse. It also fits perfectly. Note how the stirrup leathers hang straight down in a perfect vertical, indicating the saddle is level. Above, my personal Western saddle, by Ray Holes. It is on the same horse, and see how it also fits perfectly. Another example of a saddle that does NOT FIT!!! COLIN SUCCESSFULLY FITTING A SADDLE IN SCOTTSDALE, ARIZONA. HE SAYS: "THERE IS NO MAGIC TO FITTING SADDLES. IT IS ALL ABOUT EVEN PRESSURE, WHICH MEANS THE SADDLE MUST SIT LEVEL. THAT SAID, THERE IS QUITE A BIT OF MAGIC TO MAKING CHANGES THAT RESULT IN PERFECTION. MY OVERNIGHT SUCCESS ONLY TOOK ME HALF A CENTURY!!!" THIS IS CAROLYN BERRY, WITH HER 2,000lb HORSE 'GAVIN' FITTED WITH A FLEECE-LINED WOOD/STEEL/TREE SADDLE MADE BY COLIN. SHE SAYS "WE LOVE IT." SAYS COLIN: "IF IT HAS FOUR LEGS AND MAKES HORSE NOISES, I CAN FIT IT !!!" Using a saddle gauge Colin helped Robert Ferrand invent, a wood/metal tree has been adjusted to perfectly fit the shape of the horse's back.